^ "Prokaryotic Gene Expression". www.ndsu.edu. Retrieved 19 May 2017. ^ Hansen LH, Knudsen S, Sørensen SJ (June 1998). 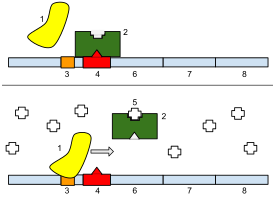 "The effect of the lacY gene on the induction of IPTG inducible promoters, studied in Escherichia coli and Pseudomonas fluorescens". Curr. Microbiol. 36 (6): 341–7. doi:10.1007/s002849900320. PMID 9608745. Archived from the original on 18 October 2000. ^ Marbach A, Bettenbrock K (January 2012). 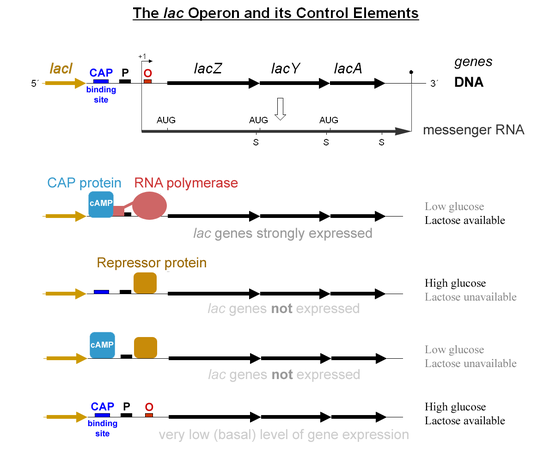 "lac operon induction in Escherichia coli: Systematic comparison of IPTG and TMG induction and influence of the transacetylase LacA". Journal of Biotechnology. 157 (1): 82–88. doi:10.1016/j.jbiotec.2011.10.009. PMID 22079752. ^ "Milestone 2 - A visionary pair : Nature Milestones in gene expression". www.nature.com. Retrieved 27 December 2015.